Construction winch is a kind of winch machine used in various construction projects including land and coastal projects to lift or pull heavy loads. Ellsen, as a professional and reputable winch supplier, mainly provides the following winch types: JM slow speed winch, JK high speed winch, JKL high speed winch, JKD planetary winch, JMM friction winch and some customized mining winches. No matter lightweight winch or heavy duty winch you need, you can just get a suitable winch solution from us. 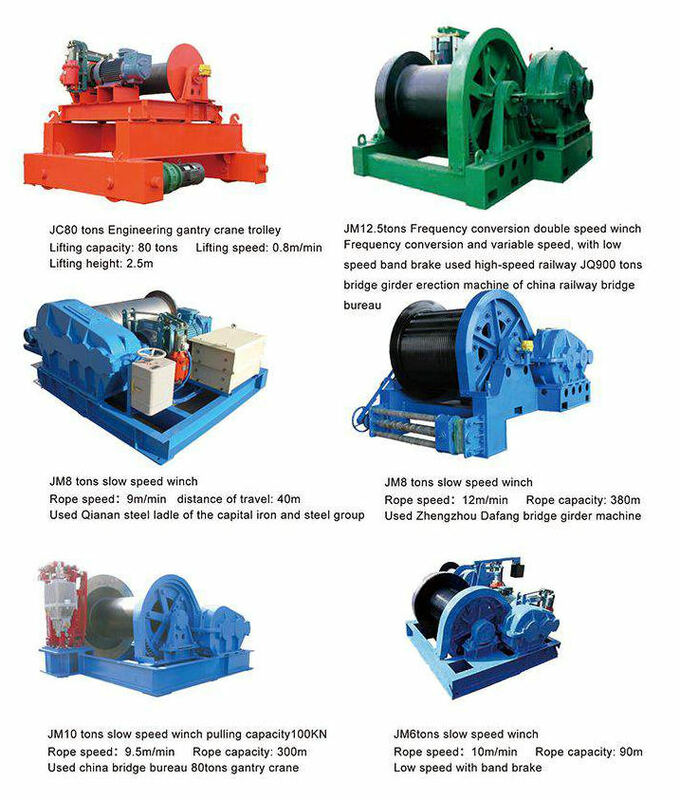 JM slow speed electric winch: this type of winch is mainly used to lift, load, unload and pull heavy loads, like mounting and dismounting of various kinds of large and medium-sized concrete structure, steel structure and machinery equipment. 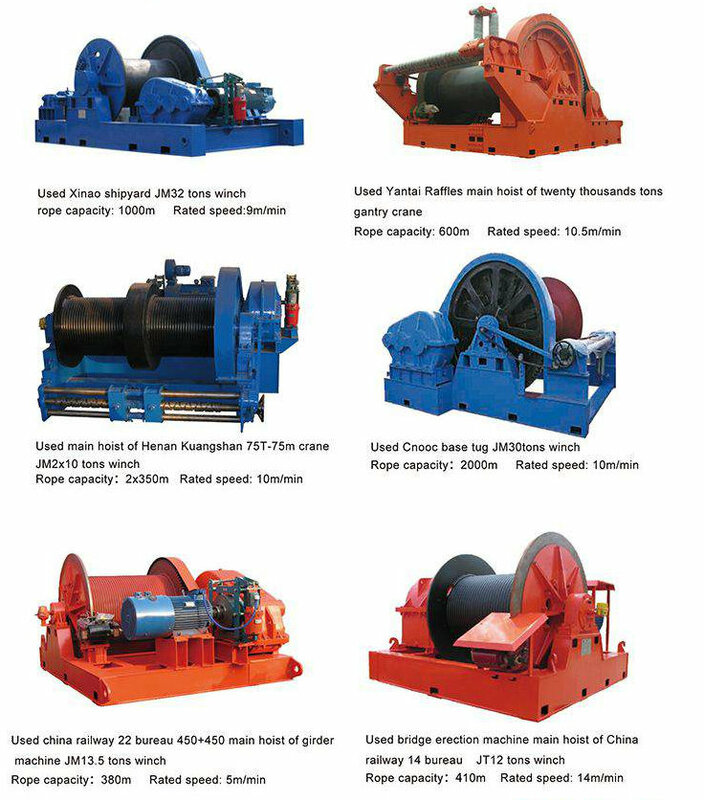 The JM slow speed winch is widely applied in construction and installation company, mining area, civil and installation engineering, and installation of all kinds of bridges, ports, docks etc. 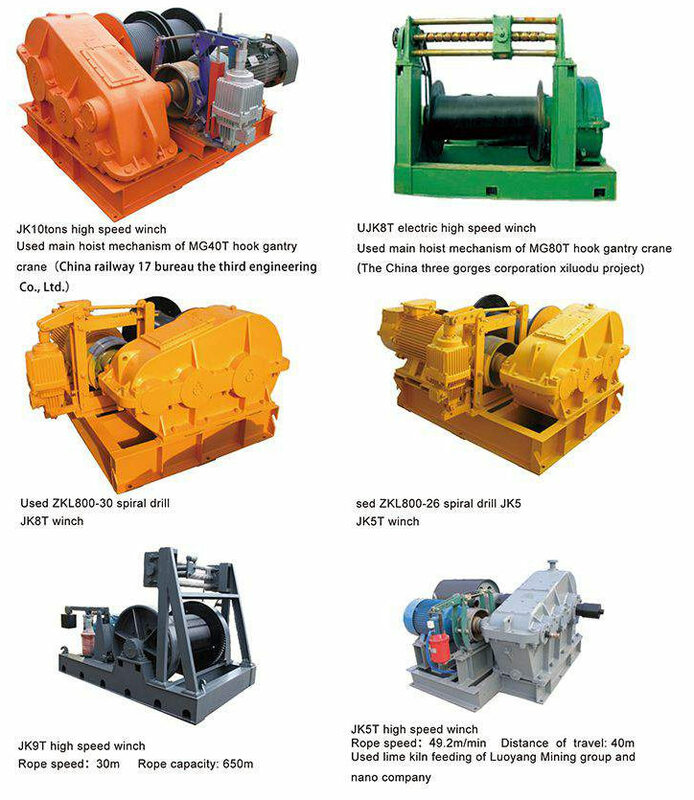 JK fast speed electric winch: this series of electric winches apply to lifting and moving heavy objects in construction and mining areas, and civil engineering and small equipment installation in factories. To suit different requirements, they are used for lifting materials, pull heavy loads during construction process and used as main lifting on cranes, and they are also special lifting winches for derrick, gantry and lifting trolleys. JKL fast speed electric piling winch: this series of hand control high speed free rolling winches are mainly used for vertical lifting heavy loads on construction site, in factory, mining area and port, especially applicable to free fall punching and piling operations of bridge, dock and construction foundation engineering. The structure feature is main shaft rotating ( known as rotation shaft). JKD electric planetary winch: this kind of winch is a new type of winch that adopts planetary gearing with small teeth difference. It features compact structure, smooth running, convenient operation, easy maintenance, low noise and long service life etc. It is an ideal replacement of traditional winch. 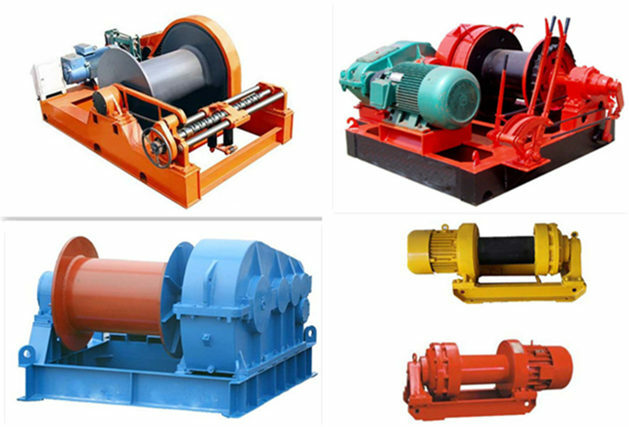 The JKD series winches are widely applied for lifting and installing in many industries including construction, port, bride and metallurgy etc. 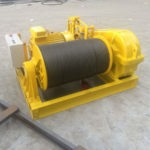 JMM friction type electric winch: this series winch is mainly used for long-distance pulling of various kinds of large and super large concrete, steel structure and steel cable and rope, and also used for large-range lifting. The friction type winch features constant speed and stable lifting. It is applicable to engineering construction of bridge, port and dock etc and equipment installation of large factories and mines and power engineering. 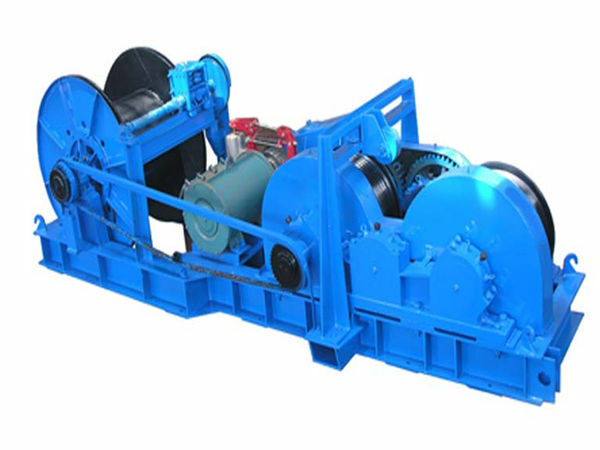 Customized electric mine winch (shaft sinking electric winch): mine winch refers to the electric winch used in various mining areas, it is installed inside or outside of the mine. The mines mainly include coal and different types of metal mines such as copper mine, silver mine, iron mine, zinc mine and so on. The winch is used to lift and pull the mines. 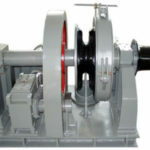 The winches can be designed and produced in explosion-proof type to suit special work requirements. Easy to install, use and transfer. Construction winches are widely used on many occasions to lift and pull heavy loads, and it is worth selecting a quality one to suit all your work requirements. As one of the top winch brands, Ellsen Machinery Equipment Company is professional in designing and manufacturing wide range of winches for clients from all over the world. Whatever you use the winch for and wherever you use it, you can just get the best winch solution from us with very competitive price. Ellsen construction winch is reliable and can greatly improve your work efficiency and boost productivity. For more detailed information on our construction winch for sale, please just feel free to contact us to get the best winch as you expect. Interested in our construction winch? click to get the best price. 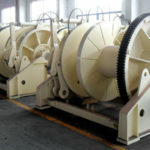 There are mainly four parts for a construction winch: electric motor belongs to drive device, reducer is used to reduce speed, spooling device is used to make the rope or cable wind on the drum evenly and orderly, and the drum is used to wind the rope or cable, including letting in and out of the cable or rope as needed. These four parts are connected with gear or coupling to transfer torque. 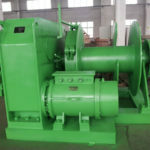 The electric motor provides power, connect with input shaft of the reducer through coupling and input the power to the reducer. 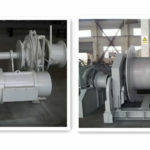 The reducer go through the output shaft via two-lever deceleration, transfer the power to the shaft of rope arranging device through the coupling, rotation of the gear on the shaft drives the parts on the drum to rotate and then the drum rotates. The spooling device is installed on the spooling shaft and it makes the wire rope wind on the drum evenly. The electric winch used for construction should be installed in the place with good view and far away from dangerous operation area; the installation of the winch should be firm and secure. The wire rope should be arranged on the drum in good order. During the work, no one is allowed to pull, step on and cross the rope, or stop under the lifted materials. 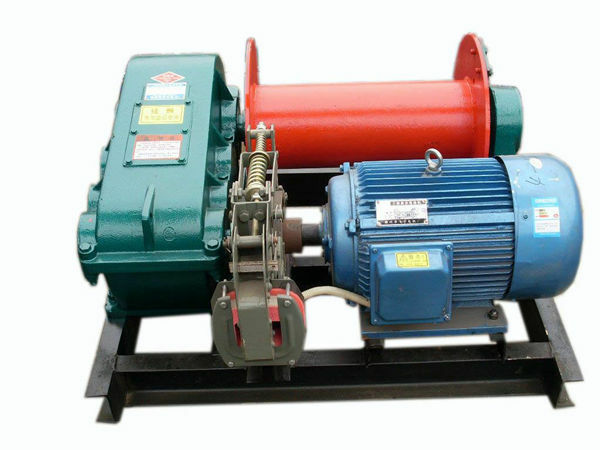 The electric winch motor should be with separate operating switch, and equipped with overload and short-circuit protection device; its metal casing should be reliably grounded to keep safe and secure. After finishing the installation, no-load test, dynamic loading test and overloading test should be carried out in accordance with standards. 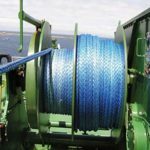 Before using the winch for lifting or hoisting, it is necessary to check the winch, wire rope, ground anchor and other parts and accessories to make sure they are all in good working condition. Whiling operating the construction winches, the operators should concentrate and see signals clearly and follow instructions. During the work, the operators cannot leave. The heavy loads should be lifted or lowered smoothly to avoid sudden lifting or lowering. If the temporary overhead stop is requested, both brake and ratchet wheel are needed to guarantee the safe operation. If power failure happens suddenly during the operations, the power supply should be cut firstly, and then control the brake to lower the objects to the ground slowly. The electric winch used for construction cannot be overloaded or used to hoist the objects that are heavier than the rated load of the winch.